Fiction – hardcover; Bodley Head Children’s Books; 592 pages; 2007. I may possibly be the last person in blogland to have read the much acclaimed The Book Thief, one of those children’s books that has crossed over into the adult market and become subject to incredible word-of-mouth marketing, helped, no doubt, by all the blog attention it got in 2006 and 2007. To be honest, I let it languish on my nightstand for 12 months, because I wasn’t sure it would live up to the hype. I’ve read my fair share of books about the Holocaust and wasn’t sure this one would tell me anything I didn’t already know. But the author, Markus Zusak, has created a wholly original story. First, the narrator is death, who talks in a kind of roundabout language, part all-knowing, part creepy, part loving. I could introduce myself properly, but it’s not really necessary. You will know me well enough and soon enough, depending on a diverse range of variables. It suffices to say that at some point in time, I will be standing over you, as genially as possible. Your soul will be in my arms. A colour will be perched on my shoulder: I will carry you gently away. And second, the main character is an ordinary German girl growing up in Nazi Germany who must confront many personal difficulties and traumas during the course of the Second World War. This is not so much a book about the extermination of the Jewish race under Nazi occupation, but the ways in which many Germans went about their ordinary lives at the time and the extraordinary lengths some of them went to save their Jewish friends. The story begins with Liesel Meminger, a traumatised nine-year-old girl. It’s 1939 and she has just witnessed the death and burial of her younger brother enroute to her new foster family in a town called Molching. During the burial Liesel picks up an object she finds in the snow — The Gravediggers Handbook — which sets up a lifelong love of books, even if she has to beg, borrow or steal them. Her foster father, the kindly accordion-playing Hans Hubermann, teaches her how to read, and together the two of them pass many hours pouring over the pages of the gravedigger’s instruction manual. Later, when the family takes in a Jewish man, Max Vanderburg, and hides him away in their basement, Leisel shares her love of words with him, too. Desperate for new reading material, Liesel — with the help of her blonde-headed friend Rudy — rescues a book from a Nazi book-burning pile. Later she is introduced to an amazing private library, owned by the mayor’s wife, which allows her to momentarily escape the dismal poverty of her ordinary day-to-day life. The Book Thief is, without a doubt, an incredibly memorable story. The narrative voice is unique, and the style, which double-backs on itself and occasionally jumps backwards and forwards in time, is interesting if somewhat confusing at times (Would kids get this? I kept asking myself). Initially the staccato rhythm of Death’s voice jarred, but I soon learnt to appreciate its whimsical charm. However, I enjoyed the story much more when Death kept his mouth shut and simply let Liesel get on with things. The characters are great, too. Liesel starts off as a rather weak-willed creature, too terrified to even step out of the car when she first arrives at her foster family’s home, but over the course of the war she turns into a feisty, courageous tom-boy, who isn’t scared of tackling anyone who bullies her. And her best friend Rudy, who has an obsession with Olympic athlete Jesse James, is a suitable, dare I say lovable, ally. I was not as convinced about the foster parents who seemed a little stereotyped — the kindly, loving father; the foul-mouthed, bullish mother — but I can understand that younger readers would enjoy the “good cop, bad cop” personalities. 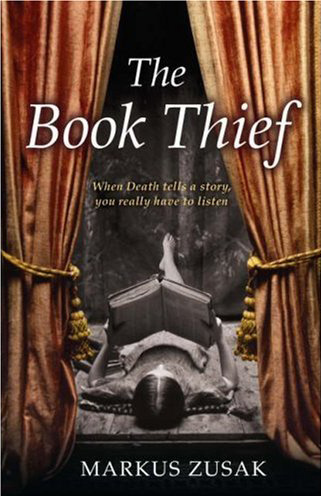 The Book Thief is a deeply unsettling story and a truly moving one. I teared up over so many scenes that I couldn’t bare to list them here for fear of running out of room! The ending is of the typical grab-your-tissues-and-sob-your-eyes-out ilk. But in reading this very long book — perhaps a fraction too long (it meanders a lot in the middle) — I never once thought I was being emotionally manipulated. Zusak does a nice line in letting actions speak louder than words, so that the reader gets to join the dots rather than have every little thing spelt out for them. I like this approach, if only because he treats the children to which this book is aimed with intelligence rather than patronising or speaking down to them. A delightfully human book, haunting, wise and joyous by turn. I don’t know why I waited so long to read it. I hate to admit it, though it might make you feel better, I have not read this book. In fact, I had not heard of it until this post. But then again I have been living under a rock, in a cave, somewhere in outer Mongolia. How else would explain my complete literary ignorance? That being said, and thanks to your wonderful post, I plan to rectify this immediately by placing this book on my TBR; bolded, highlighted, and with lots of asterisks. I haven’t read this book yet either, and only learned of its existence a few weeks ago (on another blog!) so you won’t be the last one to read it, I will! Great review. I’d been avoiding this because of all the hype as well. When I did finally read it last year, I was pleasantly surprised by how readable and moving it was. Thinking about it now still makes me tear up. Kids might not have trouble with the storyline. Harry Potter’s storyline can get complicated, after all. I haven’t read this book, either. I’ve had it forever, but just haven’t gotten around to it. Every time I hear someone talk about it, it makes me want to read it right away. But, something happens and it finds it way back down in the stack. I think that I may have put it off for the same reason as you. I don’t like knowing so much about a book before I read it. I have no doubt that I’ll read it one day. The question is simply, when?. I loved this book. I just finished reading ‘The Boy in the Striped Pajamas,’ a book that I not only wanted to throw, but wanted to throw at the author, repeatedly, and was reminded of how wonderful the Zusak book was. I’m glad to hear that you’ve read and enjoyed it. Glad to hear you enjoyed this. It still remains one of my all-time favorites. I need to read it again — there were so many wonderful passages. He has quite a way with words. I loved this book as I am sure I’ve mentioned here before. I gave away several copies as presents and they were well-received. I was a bit disappointed when the book was finally released in the UK and the US as young adult fiction. I felt this might limit the audience for the book. However, thankfully, word-of-mouth, as you say, has made sure it has been widely read. I have several editions on my shelves but the cover you show in this review is by far the best I’ve seen. PS Just ordered a copy of the Bodley Head edition: just had to add that cover to my collection. I’m glad you enjoyed it as much as I did. Death was a truly memorable narrator and all the characters were incredibly affecting. I had never heard of this book either until December when our neighborhood book club choose it for our next read. But now I see it everywhere. I loved it! This was a wonderful review. Thanks so much! I’m another who hasn’t read this book. I’ll finally get around to it one of these days. I think we read it alomost simultaneously. Just finished a week back. I must say, the book moves you more than you ever expect. Or atleast that was true for me for I had never read about it online. I picked it up on gut feeling and I think it was worth every minute of my time. I guess, Markus Zusak’s strength lies in impeccable characterization. I am sure I am going to pick ‘I am the Messenger’ sooner than later. But for now, I have ‘My Name is Red’ waiting for me. Is that the UK cover for the book? It is so much more attractive than the one here in the US! I had about 150 pages left to read last night and I couldn’t put it down so read it till I finished it. Loved it and sobbed my little heart out. I quite liked Death’s final line in the the novel, made me think.